The guys who started Airbnb got the idea after putting a bunch of people up who were in town for a tech conference. (We know this from binge listening to the podcast How I Built This that just so happens to feature some of the most high profile companies and entrepreneurs of the last few decades. What an earful!) The accomodation options these days, however, have gone above and beyond an air mattress in the corner of someone’s living room and a breakfast bowl of cold cereal (unless, who knows, that’s your ideal when it comes to traveling…more power to ya!). 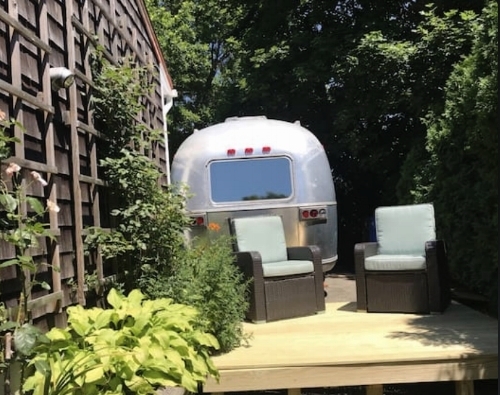 Now, after being approached by several Airbnb hosts in the New England area about staying and blogging about their abodes, we decided to check out what Rhode Island specifically has to offer in the way of unique and noteworthy accomodations. Not gonna lie, we went in search of tree or lighthouses and didn’t find any here in the OS, but ultimately, these are just as enchanting. So, let’s commence with the inspo for your staycation wish list for this winter. Last summer at the Newport Flower Show at Rosecliff, there were so many awesome tiny little houses. Truth be told, we have way too many hoarder tendencies to ever think about becoming tiny house people (the amount of books alone), but if you’ve ever been curious, this sweet listing in Middletown might be just the thing for indulging all your dreams of downsizing without actually having to go full Marie Kondo on your regular living space. Even if you haven’t hit Powerball or Mega Milions this week, you can still channel your inner Providence socialite with a stay in this stylish East Side space. The retro chic, colorful decor of this capital city room reminds us of something straight outta the Upper East Side (NYC) homes of ladies like Gloria Vanderbilt (maybe you know her as Anderson’s mom? ), fashion editor Diana (pronounced Dee-anna…who knew?) Vreeland or perhaps sartorial icon and jewelry designer Iris Apfel. An added plus, this room looks perfect to use as a backdrop for photos for your Insta, IG Stories, and the like. If the closest you’ve come to log cabin life is a container of Lincoln Logs (do they even make those anymore? ), the Little House books (which we now know were written by Laura Ingalls Wilder’s daughter Rose and not LIW herself…wow, just wow), or an episode of Riverdale (Gosip Girls meets Twin Peaks last we checked.) or Sabrina, then you’ll be interested to know that you can book a stay in a real life one right here in the OS. Located in EP, the guest suite in this cabin offers the best of old time-y charm with all the modern day comforts of home for your next staycation in the West Bay. Also walking distance from the historic, 123 year old Crescent Park Carousel.